Set the scene: While technically, the Second City e.t.c is the little brother to the Second City Maintstage ensemble that often benefits from spillover from the perennially sold-out shows shows upstairs, both ensembles (constantly churning with up-and-comers) consistently produce some of the finest sketch comedy you’ll find on a Chicago stage. In fact, sometimes this talent is so ascendant, it doesn’t make it to the Mainstage before being snatched up by a higher power (i.e, SNL’s heist of e.t.c’s Aidy Bryant in 2012). What’s it all about: Second City e.t.c’s 40th Revue, A Red Line Runs Through It, declares its intentions directly in the opening number as the cast don dayglow-painted Guy Fawkes masks and perform an EDM-driven dance number that’s both funny and unsettling. They are out to provoke – laughter and other emotions (guilt, fear, anger, for starters). While I may have griped in the past about Second City dance numbers that didn’t seem comedic or satiric, this number is both and announces upfront that it intends to not just be a sketch show, but also a revue in the classical sense. This is followed by a series of winning sketches including a look at queasy race relations in Ravenswood, a Hamilton parody on the current stalemate with appointing Scalia’s successor in the Supreme Court and a bar trivia contest in which a friend excels in ‘90s factoids — but only at the expense of triggering crippling childhood memories. As this satisfying show comes to close, a clear theme emerges: how does the past inform our future? 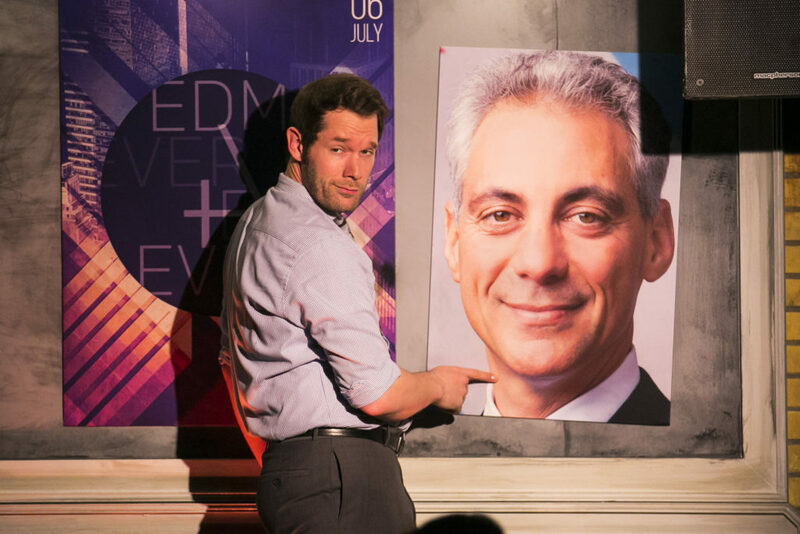 Also, check out: The Second City e.t.c. program credits Neal Stevenson and IDEO, a cutting-edge Chicago design firm, for their help with the production. I’m guessing IDEO is responsible for some slick lighting effects the technical team uses at times to suggest an overhead El train. Every Second City show I’ve seen in the last few years seems to push the envelope a bit more technically and this Red Line is the latest gleaming example. More of this, please: As a theatrical institution approaching 60 years and more popular than ever, Second City is undoubtedly part of the city’s cultural fabric. It would be natural to assume it’s mellowing in its middle age. It’s clearly not. To wit, a blistering attack on the Rahm Emanuel administration that approaches 10 minutes just before the intermission. You won’t hear anything new (Yes, it’s likely that the Emmanuel administration buried the Laquan McDonald case until his successful reelection. ), but it’s still quite something to see Second City speak this truth so loudly and repeatedly in a mock tribute to Emanuel’s smiling visage. The satire is bolstered by delivering this in the form of a musical number that spans genres from hip-hop to ‘40s Andrews Sisters. This message lands even harder when two of the loudest voices in this medley are African Americans (Beasley and Aaisa LaShay Bullock). Do this first: Like trying to find something downtown that’s affordable yet interesting, you should proceed in overpriced Old Town with caution. Sushi at Kamehachi on Wells is a good bet – but make reservations. Do this after: Drink across the street at the Old Town Ale House and enjoy some of the city’s most risqué, satiric art. Buy Tickets at http://www.secondcity.com or call 312-664-4032.